2) I still have places available for all day sail on Saturday 17th June, meet 10:00 for 10:30 departure. Note this is 1 hour later than that published on the sailing program. Because of low water tide times we will be back approx. 8:00 PM Saturday evening. Weather permitting it is hope to sail to Mullion, where we can anchor and have lunch. So please bring pack lunch with you. Tea/coffee/milk biscuits provided. Happy Return will be moored with many of the other traditional craft along side the quay in West Looe on the Friday and Saturday Nights, probably departing on the Sunday evening for Polperro if the forecast permits or some other such port of call. During the regatta on the Saturday and Sunday the Luggers will depart the quay in West Looe daily, leaving on the morning falling tide and return again on the rising evening tide. This event is open to all members of the MBLA regardless of experience and maybe attended as either a one day event or for the whole weekend. This includes the passage to Looe or the return to Penzance. Looe is at the end of the Branch line from Liskeard so may be reached by rail for anyone wishing to sail during the regatta, or you can just drive if you wish. If you would like to sail on any part of this event please call Mark on either 01736-333224 or mobile 07766913836. All are welcome and we still have space for you, so don't delay call or email today. Due to a cancellation for Scillies long week end depart Friday 26th May, return Monday 29th May weather permitting (too early to say yet) - there is an available place. If interested please contact Skipper David ASAP. David is planning a crew meeting Tuesday evening 7:00 PM at the Pirate Inn, Penzance to discuss the weekend's activities/food etc. I am afraid that the planed antifouling of Happy Return on Wednesday the 29th March will need to be scrubbed as the weather for this period is forecast to be strong winds from the south. Not only strong wind but rain as well. Thank you to everyone who volunteered to help on the slip, we will be trying again in a couple of weeks. Maintenance is ongoing, meeting on Saturday mornings at about 10:30am. All are welcome. As announced in the Sailing Programme, Happy Return is scheduled for a visit to the slip for the annual anti fouling ritual and general painting on Wednesday 29th March. It will be greatly appreciated if you can spare a few hours to help with this. Muster on the slip from 10:00 onwards. The slip is located adjacent to the sailing club. Anti fouling is a mucky job, so please wear your muckiest clothing and head wear. Wellies will also be useful for scrubbing off on the slip. Please note that putting HR on the slip is very weather dependant and the event may be postponed unless conditions are ideal. Please let Mark Mitchell know if you can spare a few hours on Wednesday. He will contact you on Tuesday 28th March if the event needs to be postponed. This is a reminder that your MBLA membership is now due for renewal as from the AGM. I hope you enjoyed sailing with us last season. The skippers have already been busy preparing this year’s sailing program and hopefully it will be equally as good. I and the committee also look forward to your continued support for the coming season, let’s hope the weather is kind to us and we have good warm spells with fair winds during 2017. I am sending this as an Email this year to majority of the members so I can reduce the cost of postage to the association. I hope this is OK with you. If you want a written letter, please email me with the request ASAP and I will send you a letter, hopefully before the AGM. Membership renewal will be due on the date of the AGM to be held on Wednesday 15th March ’17 at the Yacht Inn, Penzance, 7:30PM for 8:00PM start. The Membership Fee is £20.00 per person per year. Cheques payable to: MBLA. You can pay by Cheque or cash on the night of the AGM should you decide to attend or by post to me at the above address. You can also pay by On Line Banking for those of you who manage your finances On Line. If so here are the MBLA Bank details: Bank is HSBC; Sort Code: 40-36-13; Account Number: 91415484; Please put your name in the Payee’s Reference Box (Or Similar). This is required so we can identify your payment. Also, please back this up with an email or text message to my mobile, details above. Please note we now have a new Email system to notify our members of forthcoming events, Sailing Programs (& changes) etc. It is very important that we have your correct email address otherwise you will miss out on some important events or changes going on within MBLA. If you have changed any of your personal details; email, phone, mobile, address and NOK etc. please let me know so I can update my records. You may do this by either email or text, my details are above. The 2017 season Sailing Program will be available at the AGM should you decide to come and collect it. If not, it will be sent to current members preferably by email if you have one (that is why it is important to have your correct email address). If not, it will be posted to you ASAP after the AGM. Look Forward for Your Continued Support, Happy Sailing During 2017. Why not visit our new web site: www.happyreturn.org, and you can now also watch where HR is sailing as we have now installed AIS on Happy Return? You can follow her progress by going to Marine Traffic: http://www.marinetraffic.com/en/ais/home/centerx:-5.5/centery:50.1/zoom:20. Go to the Search box (upper left hand corner) and put in ships name (Happy Return) and it will tell you where we are etc. You can also download the App to your mobile or tablet if required but there might be a small cost for this? Welcome to 2017, I trust that you have all had a wonderful Christmas and survived the New Year celebrations. Looking back at 2016, we had quite a good sailing season with not too many breakages (for a change) and the weather was far from the worst we’ve seen. September saw the Happy Return moving to Gweek boat yard for pre-planned work by Andrew Massy. The forward covering board on the starboard side had developed some rot which needed to be attended to promptly. Andrew, true to his normal standard worked like a Trojan completing the work on time. Whilst this work went on members gathered to scrape and paint the boat so that she was looking ready to start the 2017 season. The Happy Return then sailed back down river under the command of John Van-der-Hoff (and a fine bunch of stalwarts) on the 20th October heading for the Penzance Wet Dock. Needless to say, that is not all of the work to be undertaken and work will re-commence in the near future. During the 2016 sailing season, Happy Return visited the Isles Scilly on three separate occasions, calling into all the main islands and anchoring in some new locations throughout the archipelago, such as the west side of Great Ganilly and Puffin island. The Happy Return also attending Sea Salt and Sail in Mousehole. This is a traditional festival which gives members of the public the opportunity to see many of the old historic boats from the South West and Brittany. It was during this festival on the Saturday morning when guest crews were taking breakfast on the quay, that someone made the comment. “Is that boat moving in the Bay” on closer scrutiny it was seen that one of the visiting boats from Belgium had dragged its anchor and was well on its way to grounding on Penlee Point. The crew, who had been totally oblivious of the situation, came running down the quay embarking post haste on HR. The crew of the Happy Return castoff and proceeded to steam out of the harbour at full speed. Helmed by the intrepid Nick Darling, Happy Return was put alongside the stricken vessel to embark the crew. Meanwhile the R.I.B from the Penzance Sea Cadet Corps had been gallantly pulling the vessel in an endeavor to clear it past Penlee point. All went well with just the smallest amount of paint damage to each vessel. So all in all a very interesting start to the day with the Sea Cadets proving to be the heroes of the hour and Happy Return being the fastest Lugger to depart Mousehole in many years… all very exciting. Looking forward to 2017, once again I trust we will have a good season and I look forward to seeing you all in the New Year. Restaurant, Penzance, on Friday 13th January, 7.30pm for 8.00pm. Coffee, tea, wine, spirits, beer and soft drinks are available at extra cost. This event is open to members and their family, partners and friends. bookings and choice of menu with Senara. Please book with John van der Hoff by email only: stating your name and name(s) of your guests. You will receive and email from me to acknowledge your booking. letter appearing against each choice of course on the menu. Alternatively, please send a cheque (payee MBLA) to me: John van der Hoff, Maple Barn, Nancherrow, TR19 7PW. Don't miss this opportunity to swap tales of drama on the high seas or painting the gunwales with your fellow members. I look forward to seeing you all on 13th January. In the meantime, have an outrageously enjoyable Christmas and New Year. As I write, autumn is upon us and our sailing season is over for this year. However, we can now look forward to the return of next season and the fresh sailing programme offering new ports of call and of course the ever popular ones. In addition, we have the bi-annual Looe Lugger event to look forward to. I do hope you had some good sailing on Happy Return this last season. Happy Return will be returning to her winter berth in the Wet Dock on Thursday 20th October having spent a month in Gweek boatyard having her cover boards replaced and some ancillary works done. The weather wasn’t brilliant this last season with some trips cancelled due to weather but there was also some very good sailing. This year it was the bi-annual Sea Salt and Sail Festival at Mousehole in early July. The weather wasn’t good but the event is always very enjoyable. Some 40 plus boats attended the event. Mike Halse was the skipper for the weekend with Nick Darling mate. Racing around the buoys was held on Saturday. It is always keenly contested and Happy Return acquitted herself well as you would expect of an old lady! She also took part in the Parade of Sail adding to the wonderful spectacle of so many classic wooded boats for all to see. We also took part in the annual PASAB race in late July. Mark Mitchell was the skipper with Mike Tudor mate. The weather on the race out to Scilly wasn’t very kind to us with little or no wind for the whole trip. The race around the Islands on Sunday started later than usual; in order for Happy Return to complete the course and get back into St Mary’s at a reasonable time. She set off before the official start and was unfortunately disqualified however it was an enjoyable sail around the Isles. The return race on Monday back to Penzance was our sort of weather with a steady wind on the quarter and Happy Return romped home back to Penzance. On 14th August Happy Return attended the Porthleven Lifeboat Day. John Tellam was the skipper with Clive Humphrey mate for the weekend trip. She sailed over on Saturday returning on Monday. The visit was very popular and she drew a lot of interest. She was open to the public for them to view a traditional Cornish fishing Lugger. Most members will know she was built by Kitto in Porthleven in 1904/5. There is now a provisions shop where the old Kitto Yard was situated, opposite the quay. On the day the Cape Singers came and performed from her deck which drew a large crowd who appeared to enjoy the singing. The visit was such a success we have been asked if we will return for next years Lifeboat Day. On leaving Porthleven on Monday we created a little bit of history, we were the first Lugger to sail out of Porthleven harbour for 50 years. The annual Newlyn Fish Festival was a great success, it is our main fund raising event of the year and we appreciate all of our members who turned up and lend a hand on the bank holiday and the day before to help set things up. We would also like to thank the members who contributed towards the afternoon slice of cake and a cuppa. This goes down very well with the public. The Fish Festival is a lot of hard work but also very enjoyable. Fortunately, the weather was good this year. This winter we will be holding a series of events in addition to the Annual Dinner and AGM. We do hope that you will find them of interest and will come along. There is nothing like a good pint and some nautical chat to help brighten up the winter I will be sending out a separate programme of these events and dates for you to keep in your diaries shortly. That time of the year is fast approaching so if you are thinking Christmas presents don’t forget that we offer a wide range of polo and T-shirts, fleeces with or without hoods of all sizes, all with our logo embroidered on them plus useful stocking fillers such as key rings with a picture of Happy Return and leather bookmarks with our logo. We also hold in stock prints of a painting of Happy Return done by a local artist. Contact John Tellam and check what he has available in stock, if he doesn’t have it he can order it. The annual winter maintenance programme for Happy Return will be starting soon and we will need your help. If you are not aware we meet up where Happy Return is moored in the Wet Dock at about 10.30am on Saturday mornings. Don’t worry if you don’t have any technical skills just to be able to wield a paint brush will be okay. Do come, it’s not all hard work but an enjoyable few hours spending time with shipmates chatting over sails past and future. If you are able to spare some time on a Saturday contact John Van Der Hoff. It gives John time to plan what’s to be done and who is available. Just to end this news, if you would like to put pen to paper and share with other members one of your sailing experiences on Happy Return or any other sailing experience, it doesn’t have to be long. I would very much like to hear from you. Happy Return is currently laid up ashore in Gweek boatyard for repair and general maintenance. We are looking for volunteers to help out on Saturdays (commencing 1st October) with all general maintenance tasks such as sanding/painting, cleaning etc. The work day normally commences at 10:30 and finishes at around 16:00. If you can spare a few hours within that time frame to help out, please contact skipper John vd H for details of where to meet etc. Telephone number is on the printed program - or send an email via the link on Sailing Program - click here. Please note that John does not have a mobile signal at his home address, but you can leave a message on his voice mail. Work does occasionally take place on weekdays and there will be a few of us there on 29th September (Thursday) so let me know if you would like to join in. "A shining example of a well run heritage boat organisation." 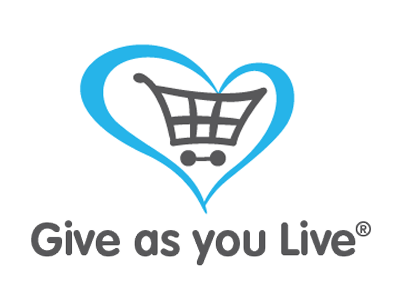 Register for “Give as you Live” - Click the image above to be transferred to their site.